Get your child hooked on reading with even more action from "Star Wars Episode 1". 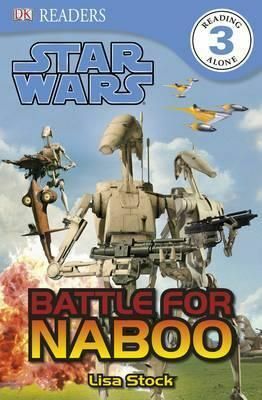 In this exciting and action-filled "DK Reader", witness the climatic Battle of Naboo from "Star Wars Episode I" while learning about the characters and their weapons and vehicles. Queen Amidala and her people must join forces with the Gungans in order to reclaim their home planet of Naboo from the invading droid army. Filled with stunning pictures from "Star Wars Episode 1", it's an out-of-this-world read. And don't forget, there's a galaxy-full of "DK Star Wars" books to collect.